I really hate logos. I know some people like to wear them as show of their wealth, but for me, it’s just free advertising for companies that don’t need the publicity. And they can ruin decent items. 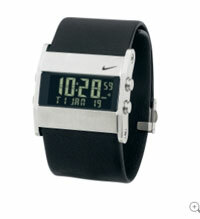 Take this Nike Lance Armstrong watch, part of the Oregon Square Digital series of watches. I really like it’s simplicity – a throwback to the early days of the digital watch. And if you’re a sporty type (like the famous cyclist turned modern day watch designer), it’s got various timers and settings suited to your training (including a hydration alarm), plus a leather strap and scratch resistant face. It’s just that Nike logo – it really puts me off, especially at a price of £140.